Easy-to-use A 10 basic batch mill has increased safety, with features including how the mill can only be opened when it is still and only operates when the cover is closed. It also has a quick-stop function, which further increases safety for the operator. A membrane keyboard makes operation easy, while the digital timer and a counter showing the grinding time and error code display are additional user-friendly features. The mill is unique in allowing users to reduce the capacity of the grinding chamber for small sample sizes. 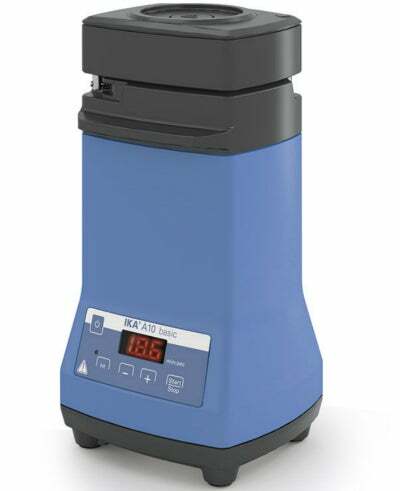 The redesigned batch mill with integrated cooling water connections grinds hard, brittle, soft, and fibrous materials up to a volume of 50 ml. Samples become brittle in the grinding chamber, which means that tough, oily, and aqueous samples can be processed. The A 10 basic can be operated in intermittent mode. The cover is easy to open and closes with a bayonet lock, while cutters and knives can be replaced in just a few simple steps. The A 10.1 stainless steel cutter is included in delivery. The mill can be used in virtually any industry, especially in food, cosmetics, and chemicals, agriculture, and pharmaceuticals.